Skin, tendons, ligaments, cartilage and even bones wear out over time and lose their strength and their original integrity. With a healthy diet and regular exercise it is possible to slow the degeneration, but to what extent? Years of exposure to air pollutants, lack of sleep, the sun, rapid or significant weight gain and / or loss, poor ergonomics at work and in bed, will sooner or later leave their marks. Is it possible to make up for some lost years or increase the resilience after injuries? The answer is YES. Thanks to an innovative formulation resulting from the latest discoveries of science, restructuring and the synthesis of collagen (a protein in human connective tissue) is now possible. Collagenik gives a firmer more youthful skin, helps rebuild cartilage and tendons, and even promotes rapid healing after surgery. The hydrolysed bovine collagen is bioactive, which stimulates the production of human collagen (specific protein of skin, cartilage, bone and other connective tissue) Collagen is the most abundant protein in the human body. It is present in the blood, muscles, cartilage, skin and many other tissues. 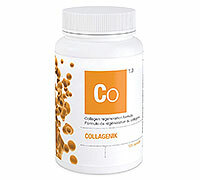 Derived from poultry sternum cartilage, collagen UC-II ® is undenatured and is of native type. This particular form is unique and proprietary to modulate the immune system and reduce autoimmune diseases attacks such as rheumatoid arthritis and some forms of arthritis. Several scientific studies have reported outstanding results with UC-II ® including: significant reduction in joint pain in less than 30 days, 79% more effective than glucosamine sulfate and chondroitin over a period of 30 days to increase joint mobility. Antler velvet powder is extracted from deer antlers. 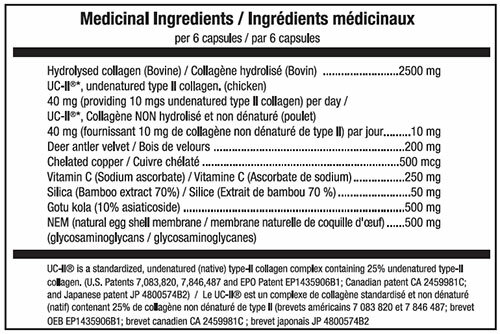 It contains several minerals, cartilage, enzymes, anti-inflammatory prostaglandins and growth factors. Its use in traditional oriental medicine dates back over 2000 years, whether as an energizing tonic to increase hearing or even promote healing of stomach ulcers. Current scientific evidence allow us to say that velvet antler helps heal wounds of all kinds and can also slow or reverse the progression of arthritis. This plant originated in Asia and Oceania is one of the basic compounds of Ayurvedic medicine. The toning properties of this plant have been known for millennia. For over 80 years now, we know through numerous scientific and clinical researches that Gotu Kola is very effective to improve many conditions such as varicose veins, lack of skin tone, minor burns, ligament tears and even fractures. Several recent studies also show that Gotu Kola has a very interesting effect on hypertension and good humor. The NEM is the film present inside an eggshell and since a few years now, we discovered its many properties for humans. It naturally contains a substance called glycosaminoglycans and several other proteins necessary for joint reconstructions of all human connective tissues. Recent studies have shown that NEM significantly reduced pain and joint inflammation and promote healing in people suffering from various forms of arthritis and other connective tissue disorders. Copper is a mineral found in trace in the human body but is necessary for the proper functioning of several organs and metabolic processes. It is also essential in the production and regeneration of collagen and elastin, the two compounds primarily responsible for skin firmness. Vitamin C is essential for the human body. A very good antioxidant, we already know its properties on general health and its importance in the production of collagen. Silica is a basic compound of any living organism. It is the element necessary to support tissues such as tendons and cartilage. It ensures the firmness of the skin by participating in the composition of the elastin and collagen. In addition, it allows the bones to retain calcium ensuring their strength and hardness. Recommended Use: A unique and powerful formula for type 1 and 2 collagen regeneration of the skin, tendons, cartilages, ligaments, bones, muscles and of any connective tissues. Anti-inflammatory, it also slows down the ageing process of connective tissues. Recommended Dosage: Adults: Take 2 capsules three times a day with your meals. Consult a health professional for a use of over 3 months.